“Dr. Abrankian explained the problem, showed the x-ray results and I am getting the help I need.” – V.T. On your second visit, you will receive a complete detailed report of your findings. We encourage concerned spouse’s to attend for this most important discussion. Upon arriving, you and your spouse will be escorted into our report of findings room where your x-rays will be on display. Dr. Abrankian will discuss your results. Four key concerns or questions are answered. Thirdly, how long will it take? Any home recommendations are discussed in addition to any questions. Once completed, we proceed forward with care. 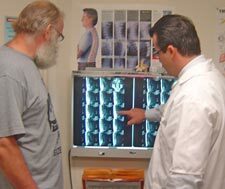 Click here to learn what you can expect at your regular visits to Abrankian Back & Neck Center.